If you like your highlights with a bit of analysis thrown into the mix as well, then Match of the Day is on at 22:30 GMT tonight on BBC One, or 23:25 in Scotland. That's all from us but we will be cranking up the live text commentary machine for Shrewsbury versus Manchester United on Monday night. Missed any of the goals from the fifth round? Don't forget you can watch highlights from all the games here. Come on the Shrews lets get the Hammers up to the new meadow then down to Wembley for the semi finals. SMS Message: Great draw for the hammers! Man U still have to win away to league 1 side Shrewsbury... MK Dons anyone remember them? from Andrew Steele in Southend. Great draw for the hammers! Man U still have to win away to league 1 side Shrewsbury... MK Dons anyone remember them? Manchester City boss Manuel Pellegrini: "I feel we had a very good 45 minutes but after the five minutes after half time we threw away the game. There was a counter-attack and set-pieces. Chelsea played well and scored the goals. "We were forced to select that team, we couldn't play another day and didn't have any more fit players. We knew it was a difficult chance to carry on in the FA Cup. We cannot do anything more. "If we play on Saturday, it is better for us, then we play in the Champions League for England. We have six players injured and cannot take any more risks. We played against a very good team and that's why they won." Kerry Peter Parvin: So if Arsenal win we get Watford! Happy with that draw now let's get Hull out of the way! Game of the People: Good chance London will have a club in final...maybe two. Pablo de Roman: Arsenal should not get an easy fixture! They've won enough fa cups recently. Reading versus Crystal Palace sees Alan Pardew going back to his old stomping ground. Pards was manager of the Royals from 1999 until 2003. More from Guus Hiddink, reflecting on the 5-1 win over Manchester City: "Manchester City made changes but that doesn't make it easy because the youngsters that came in were dangerous. It was key that we started well in the second half, got an early second and third goal." Gary Trudgett: Not the best of FA Cup draws for both West Ham or Chelsea. Form teams drawn away against good opposition. Charles Kahanji: Man United to face West Ham should they navigate past Shrewsbury. A good fixture for the hammers I've to say. 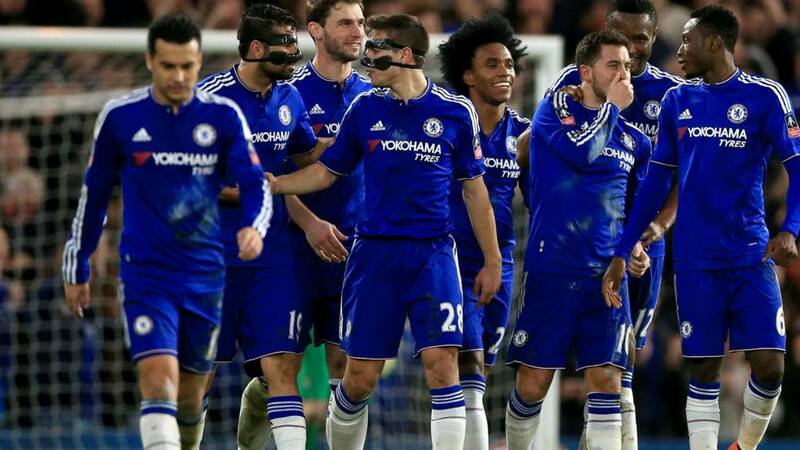 Chelsea boss Guus Hiddink, on the FA Cup quarter-final draw putting them up against the team they faced in the 2009 final: "It was a long time ago. They are longing for revenge. We hope to maintain the flow we are in in the FA Cup." I was but a carefree 26-year-old when Chelsea won the FA Cup under Guus Hiddink back in 2009. Their opponents that day? Everton. "It is hard to pick a favourite. I know there is a replay still be played, but I would have to favour Arsenal." There we go then, Everton v Chelsea perhaps the pick of the ties. Games will be played 11-14 March. Shrewsbury, the lowest ranked side left, are hoping to reach the sixth round for the third time in their history. Manchester United were beaten in the sixth round last term courtesy of Danny Welbeck’s goal for Arsenal at Old Trafford. West Ham - beaten finalists a decade ago – reached the sixth round once since then, losing to Stoke in 2011. Arsenal won 2-1 away to Man Utd in R6 last year. The Gunners are unbeaten in 15 rounds of the FA Cup. Hull drew at the Emirates despite making 10 changes to their starting line-up. Watford last reached the sixth round of the FA Cup as part of a run to the semi-finals in 2007. Everton last reached the sixth round in 2014, losing 4-1 at Arsenal. Chelsea last lost in the FA Cup sixth round in 2008 – going down 1-0 away to Barnsley. Reading have lost one of their last 10 FA Cup matches. Palace have been drawn against Premier League opposition in the last five draws. The balls are in the pots. It's draw time.